Today is International Day of Zero Tolerance for FGM introduced by the United Nations 16 years ago. 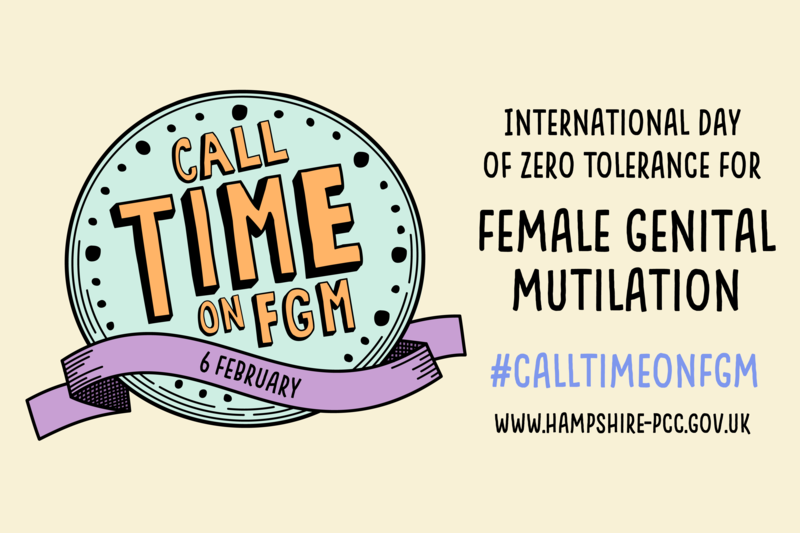 The policing response has developed considerably in Hampshire, developing partnership working through awareness training to equip those frontline services dealing with families to prevent Female Genital Mutilation (FGM). I am the Tactical lead for Honour based abuse, Forced Marriage and FGM for Hampshire Constabulary. Having worked with communities and partners around these hidden harms for nearly ten years, I can see how far we have come, but also how far we still have to go. Hampshire Constabulary has worked to train staff and officers to increase awareness and understanding of these issues so that we can build trust and confidence with the public we serve. We understand the risks that affect many people reporting these types of incidents or crimes. We know that too often those affected are too scared to call the police or to speak to another agency for fear of reprisal from their families or communities. It may also be the case that restrictions on the person’s movements are so intense they do not have the opportunity to ask for help. Hampshire Constabulary is working constantly with partners (including Health, Children’s services, Education), non-governmental organisations (NGOs) and communities to look at ways to promote reporting, demonstrate our commitment to helping the most vulnerable and keep our communities safer. The FGM operational groups in Southampton and Portsmouth reflect this focus alongside the strategic force-wide group which feeds into the South East regional work, and both groups have organised awareness raising events with partners and affected communities to take place on International Day of Zero Tolerance for FGM. Only two weeks ago, on 22 January, Hampshire Constabulary hosted a regional event with the Home Office promoting our use of FGM Protection Orders – a tool now being used more frequently by agencies to protect young girls and babies from being subjected to this procedure. This supports the national pilot where police forces obtain all Forced Marriage and FGM protection orders directly from the courts to increase our ability to signpost and safeguard people more effectively. Guest speakers bravely shared their personal experiences to give an invaluable insight into honour based abuse, including Forced Marriage and FGM. We recognise the importance of working closer with community groups to discuss this cultural practice, promote the wellbeing of women and girls, and explain the health implications of FGM and criminal/civil law. The Police and Crime Commissioner has funded Community Development worker posts in both Southampton (Yellow Door) and Portsmouth (SDAS) who are actively supporting survivors of honour based abuse, forced marriage and FGM as well as working in local communities. Going forward, we will continue to increase our focus on the cultural practice of breast ironing in our communities and explore how to support partners to recognise and respond to this practice and protect those who need our help. Hampshire Constabulary and the Police and Crime Commissioner’s team will continue to look at ways to prepare frontline officers and support services, protect those at risk, prevent these harmful practices and pursue those who are involved in offending.